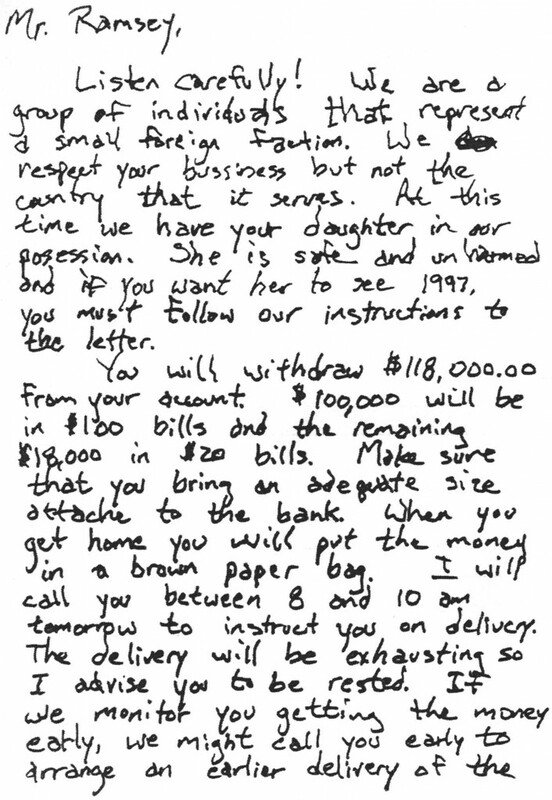 handwriting looks nothing like the California z letters imo.this one came from Atlanta, ga right? Eric X wrote: handwriting looks nothing like the California z letters imo.this one came from Atlanta, ga right? Yep. 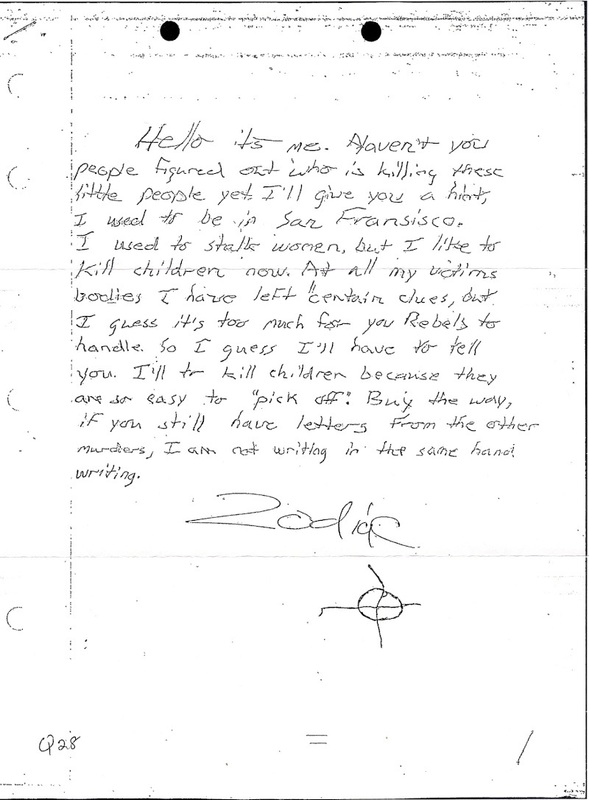 And I agree, the handwriting is a lot different, but it still could be the same person that wrote the Z letters. I don't think it is personally, but I'm not ruling it out or anything. It kinda does look like the same sloppy writing. More telling than the writing are the Bold faced ciphers. They are in your face and written but not mentally processed. Are there any suspects that moved to Atlanta at any point before this letter was sent out? Ed edwards was caught in Atlanta previously. When taken in he was in possession of a policeman's uniform. It's suspected that the Atlanta child murderer was posing as a "white uniformed police officer", which would explain why these kids would continuously get murdered if they were being picked up by someone in a police uniform and being told they were being taken home to safety. Edwards was itinerant. He also wrote a book. The book is essentially a palimpsest. It's all ciphers. Names are changed but locations are mentioned and timeframes are mentioned. A detective thought that strange that such specific times, dates and locations are mentioned and researched crimes that match up with them. Paydirt!. In all of the locations in Ed's book, where he details weird encounters with "victims", there are murders. Ed would place himself at these crime scenes but would change the names of the victims and the nature of the crimes. Women were "roughed up" never murdered. Gas station attendants pleaded for there lives, and were "let go" with warning shots. But this never happened. Those people were murdered. If Ed mentioned the location in his book, it meant he killed there and most likely killed there often. Atlanta was mentioned multiple times in his book. So yes. There was a suspect that was there. Apologies if I hijacked the thread. I can remove it. Just ask. Costanza wrote: Are there any suspects that moved to Atlanta at any point before this letter was sent out? that guy never did tell anyone who his suspect was and then he disappeared. I really wanted to know more on the guy too. mickeydchicken wrote: Apologies if I hijacked the thread. I can remove it. Just ask. no worries bro. if Edwards was in Atlanta at the time of this letter then he is definitely worthy of discussion in regards to the letter. I had read about him being in Atlanta too some time ago but I couldn't remember a timeline of when he was there or anything like that. It's almost limiting your thinking to worry about the timeline. This was an itinerant killer. He's killing on both coasts and up the middle. He's a truck driver / jet setter / and then eventually a pilot himself. Where he lived was irrelevant, and that limiting thinking is how he got away. If he wasn't in Atlanta then he couldn't have killed them, especially if we suspect he was in NY ??? It's called a plane. He used them quite a lot. Quite a lot. A lot. The handwriting from the Atlanta letter kinda reminds me of Dennis Mower's handwriting after he was diagnosed with MS (late 70's or early 80's if I'm not mistaken). ophion1031 wrote: The handwriting from the Atlanta letter kinda reminds me of Dennis Mower's handwriting after he was diagnosed with MS (late 70's or early 80's if I'm not mistaken).